As part of the Social, Personal and Health Education (SPHE) Programme, at Cloughduv National School we encourage the children to become more aware of the need for healthy food in their lunch boxes. What people eat is known to be a key factor in determining general and oral health. Research indicates a strong link between diet, good health, performance and overall well-being (e.g. a low sugar intake promotes concentration, lessens hyperactivity, protects teeth, and lessens the risk of diabetes. A low salt intake reduces the risk of heart disease in later life). To promote healthy eating habits in our school, we introduced a healthy eating policy starting from April 2019. The traditional packed lunch of milk and sandwiches is under attack from a range of convenience foods like crisps, sweets, biscuits, chocolate and soft drinks. Parents and teachers are concerned about this trend, but some find it difficult to come up with popular healthy alternatives. We ask you to encourage a healthy lunch right from the start. 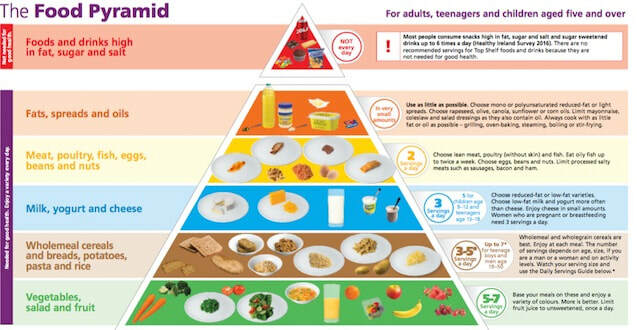 A healthy eating booklet with suggestions will be sent to our family. Growing children should get approximately one pint of milk a day, or its equivalent as cheese or yoghurt. This ensures that they get enough calcium, which is essential for healthy bones and teeth. If a child does not drink a glass of milk at lunch, encourage him to have a carton of plain yoghurt or a small helping (the size of a matchbox) of cheese instead. So as to take a proactive approach to healthy lunches, teachers will from time to time, reward children who can show a piece of fruit or other healthy foods in their lunchboxes. ​On occasions teachers may give treats to the children. not to bring in cans and glass – for safety reasons. This Healthy Eating Policy was adopted by the Board of Management.